Jessica Lange will play former German cabaret star Elsa Mars who is the manipulative leader of the troupe. 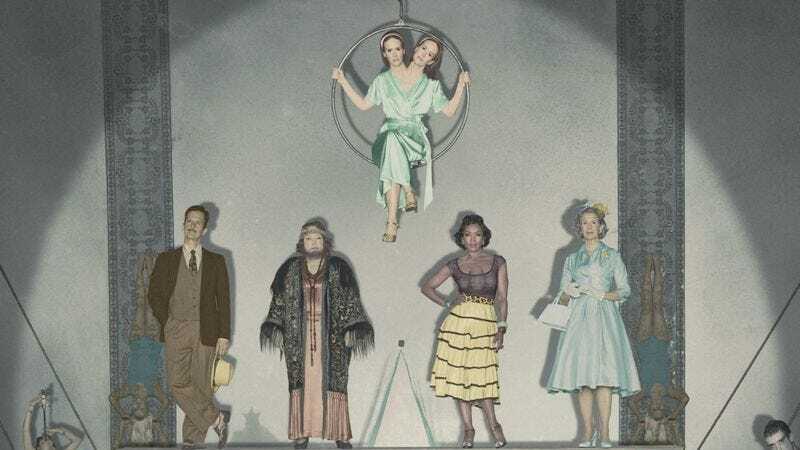 Lange emphasizes that Elsa actually does love the members of the troupe “in her own selfish narcissistic way.” The show will feature flashbacks to her youth in Germany in the 1930s. Sarah Paulson will play conjoined twins Bette and Dot who each have distinct personalities that don’t just break down into good and evil. Elsa brings the girls into the troupe to try to combat her show’s waning popularity. Evan Peters will play Ethel’s son Jimmy, a boy with lobster-like hands. Michael Chiklis will play Dell Toledo, Ethel’s ex-husband and Jimmy’s father. He’s a strongman on the run from the law who returns to the freak show and shakes up Jimmy’s alpha male status. John Carroll Lynch will play the show’s antagonist, Twisty the Clown. Twisty is a murderer who retired to Jupiter and isn’t pleased with the freak show’s arrival. According to Murphy, “He’s out to make their lives a living hell.” Murphy also promises that Twisty’s lower face mask hides a terrifying deformity that will be revealed at some point during the season. Rounding out the cast are Gabourey Sidibe as a socialite, Patti LaBelle as her MIA mother, Frances Conroy as a wealthy woman with a missing son (Finn Whitrock), and Emma Roberts and Denis O’Hare as con artists. Wes Bentley, meanwhile, will show up in a two-part Halloween episode as Edward Mordrake, a man with two faces—one of which forces him to do evil things. Murphy has also cast Matt Bomer as a “very warped” character for a one episode guest appearance, while Jyoti Amge, the world’s shortest woman, will also play a member of the troupe. The show premieres on October 8. Until then, we recommend practicing the welcoming chant from Freaks.